TV show dates: June 2, 2017 — July 28, 2017. Series status: Cancelled (per Barry Watson). Performers include: Barry Watson, Raquel Welch, Zenia Marshall, Lilah Fitzgerald, Audrey Smallman, Cindy Busby, Lochlyn Munro, Matty Finochio, Karen Holness, Chris Gauthier, Robert Wagner, Willie Aames, and Natasha Gregson Wagner. 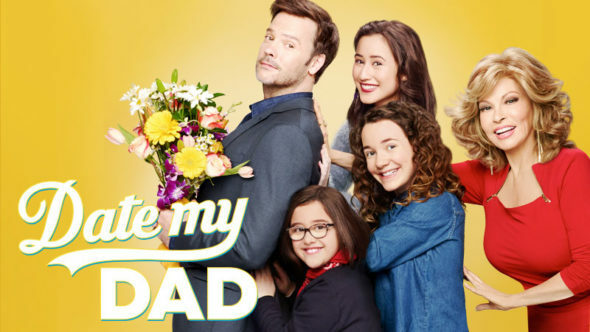 A family dramedy series, Date My Dad stars Barry Watson as widower Ricky Cooper, a father of three girls. A gym owner and former professional baseball player, Ricky had it all, until Isabella — his wife and the love of his life — died. The story picks up three years after Isabella’s death. On Ricky’s 40th birthday, his mother-in-law, Rosa (Raquel Welch) — who has been helping Ricky raise daughters Mirabel (Marshall), Elisa (Fitzgerald), and Gigi (Smallman) — informs the family she is moving out. Although she has been living with Ricky and the girls since Isabella died, Rosa realizes neither of them will be comfortable enjoying an active social life, while they’re still living together. She wants to return to dating and knows he should, too. As Ricky readies himself to assume sole responsibility for his girls, they decide it is time for dear old dad to get back in the dating game. The question remains: how will this single parent and business owner juggle all his responsibilities and a social life? As the eldest, 15-year-old Mirabel has the clearest memories of her mother. She tries to imitate her mom’s charm and elegance. Her interests include fashion, beauty, and of course social media and boys. Despite only being 12 years of age, middle child Elisa has tried to step into her mother’s shoes. She makes her family’s happiness her business and often plays the peacemaker. Precocious Gigi may be a bona fide genius, but this youngest daughter is still just a little girl. She can get frustrated when Mirabel doesn’t understand what she’s talking about. While she can be mature, she can also be a typical eight-year-old. Stephanie (Busby) is not just Ricky’s employee. A family friend, she also serves as his confidant. She’s also single and hopes to find love, but hasn’t met the right guy. Alan (Finochio) also works at the gym. Ricky relies on him as both an employee and friend, despite some of his shenanigans. Ricky’s older brother Bill (Munro) is married to Isabella’s best friend, Jackie (Holness). Bill and Jackie are physicians, without children of their own. They’re very involved with their nieces, and try to advise Ricky, even when he’s not seeking their counsel. Todd (Gauthier) is the Coopers’ neighbor. A married father of three, Todd’s family is everything to him, but that doesn’t mean he’s not enjoying the dating scene from the outside, with Ricky as his proxy. At Elisa’s graduation, Ricky comforts Elisa in her sadness at her mother’s absence and first big step into womanhood as she starts her period; Kim counsel’s Gigi in her concern about eventually having to decide between her career and having children. What do you think? Do you like the Date My Dad TV show? Do you think it should have been cancelled or renewed for a second season on UP? Loved this show. Just found it on amazon prime. Would have loved to watch more. Sad that it was cancelled. It’s a wholesome comedy that also made me cry. Wish there was more like it! Barry Watson and Rachel Welch are great! Shame it was cancelled had something it could have gone for many seasons. I just found this show on prime and I love it. The cast was fabulous together and the stories were great.